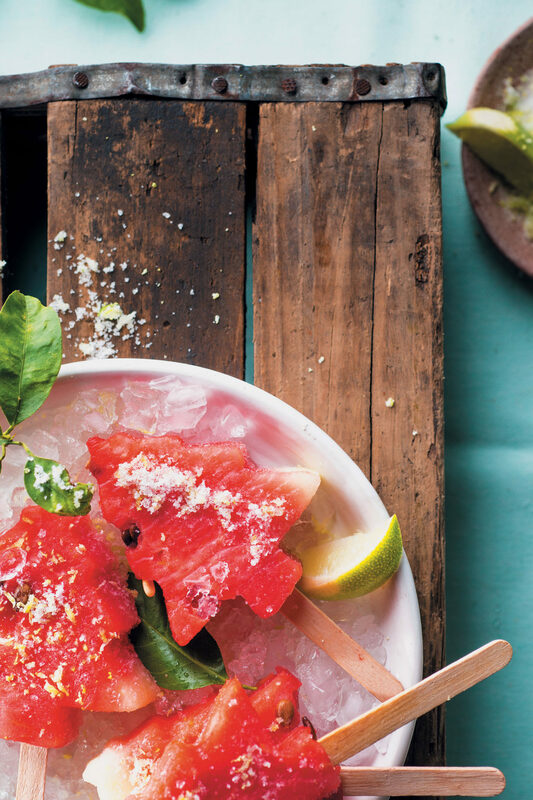 These frozen watermelon Christmas tree lollies with lime sugar are the perfect icy treats for kids over the hot South African holidays! Also guaranteed to please the adults. The best known varieties of melon are casaba, honeydew, watermelon, Persian melon and cantaloupe. But, did you know (and how very fitting), there is also a variety called the Christmas melon? Also known as the Santa Claus melon, it is so named because it peaks during the month of December. Widely available in the Northern Hemisphere, the Christmas melon is similar to the watermelon with its green and gold stripes, but is about 30cm in length and isn’t as sweet as the other melons. Unfortunately, this variety is not available in South Africa; however, one could use a cantaloupe melon as a substitute. Using a Christmas tree-shaped cookie cutter, cut out pieces of watermelon. If you don’t have a Christmas-tree cutter, simply cut the watermelon slices into smaller wedges. Push a lolly stick into the base of each cut-out and place the lollies on a tray lined with greaseproof paper. Freeze until frozen solid, 4 hours. Just before serving, combine the castor sugar and lime zest. Serve the lollies sprinkled with lime sugar.